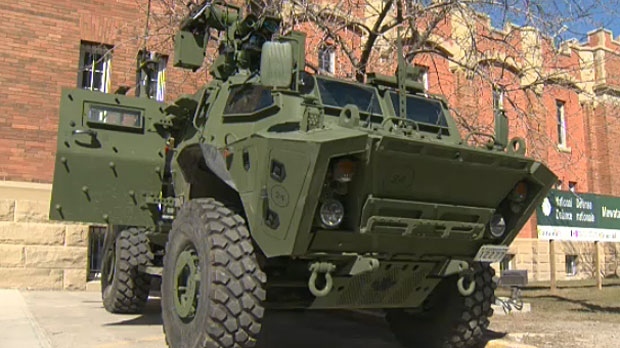 Soldiers with the King’s Own Calgary Regiment unveiled their newest piece of equipment on Sunday to help mark the unit’s regimental anniversary known as St. George’s Day. The Tactical Armoured Patrol Vehicle is a 20-ton vehicle controlled by a three-person crew and equipped with a remote weapons system, advanced sensors and a computerized drive system. Lieutenant-Colonel Christopher Hunt, commanding officer of the King’s Own Calgary Regiment, says that the biggest advantage of having access to the vehicle is that his soldiers will be able to integrate their training with the regular forces. Previously, the regiment only had access to vehicles that trained drivers but lacked a lot more skills specific to the armoured units. It takes two weeks for soldiers to qualify to drive on these vehicles, after they’ve completed their basic soldier training and a month’s worth of basic armoured crewman training. The General Utility (GU) TAPV can support three soldiers, along with the crew, to deploy in combat situations. The weapons system on the vehicle is also very impressive. “It’s equipped with a remote weapons station on top with a 40 mm automatic grenade launcher that can fire 350 grenades per minute up to a kilometre. It’s also equipped with a medium machine gun,“ Hunt says. He also says the vehicle is very fast and can handle any sort of terrain. “It will handle deep mud, it can go across country extremely quickly and that’s another important skillset for us because with these vehicles, it’s easier for drivers to make the transition into even heavier armoured vehicles including tanks,” he says. Hunt says that even with its impressive size, it handles very well. Hunt says the vehicle was unveiled to the public on St. George’s Day to celebrate the unit and allow the public to get a good look. 500 of the TAPVs will be put into service in the Canadian Forces, with 307 GU variants and 193 outfitted as reconnaissance vehicles. The King's Own Calgary Regiment unveiled the Tactical Armoured Patrol Vehicle (TAPV) as part of the unit's St. George's Day celebrations.